What is your clinical training and education? I received my education as a Nurse Practitioner at Harbor UCLA and I am board certified in Women’s Health. 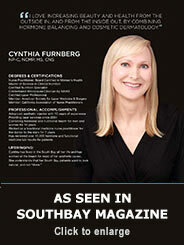 I am a also a North Amercian Menopause Society (NAMS) Credentialed Menopause Practitioner. There are less than ten doctors or nurse practitioners that have this credential in the L.A. area. Since nutrition plays a foundational role in functional or optimal wellness medicine, I obtained my Master of Science Degree in Human Nutrition. Additionally, I am a member of the World Society of Anti-Aging Medicine. 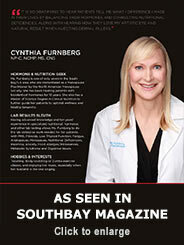 I have worked in the field of cosmetic dermatology since 2004, and I am a Certified Laser Professtional. I am also a top level injector and I'm known for my injection skills with Botox and fillers for producing natural believable results. I worked for Dr. Watson at Watson Wellness for over 7 years. She was one of the pioneers in bioidentical hormone replacement. While working at at this office, I received excellent training in treating men and women in functional and integrative medicine, treating patients for low thyroid function, gynecology, low adrenal function, hormone imbalances, hormone replacement, neurotransmitter testing and balancing, lab testing for vitamin/mineral/fatty acids/amino acids/heavy metals/oxidative stress, food allergies, GI infections, high cholesterol, insulin resistance, and more. During this time I had the advantage of reviewing several thousand lab results with patients and making needed adjustments in their prescriptions or supplements. Practicing this medicine is what prompted me to go back to school to get my Masters in Nutrition. A nurse practitioner is a registered nurse who has received advanced education and licensing. This license allows the nurse practitioner to legally diagnose conditions, and prescribe medications. What is Hormone Balancing or Optimal Wellness Medicine? Hormone Balancing is the process of determining deficiencies or excesses in hormone levels or improper ratios amongst hormones levels, and making corrections. Providing proper levels along with testing for other deficiencies or excesses in other areas (cardiac markers, body fat percentage, vitamin/mineral/fatty acids/amino acids/oxidative stress/heavy metals, neurotransmitters, food allergies, etc.) are utilized to allow for a higher level of wellness. What do you concentrate on when you are injecting fillers? I like to concentrate on placement and gentle technique. I like to place the product exactly where I want it. This way, I generally have to do little or no massaging of the product when I'm done. I feel that the less that you manipulate the tissue, the less chance there will be bruising or broken capillaries (telangectasias). This also reduces swelling. I also enjoy looking at the patient's face and seeing where they have loss of volume, such as the tear troughs, cheek hollows, marrionettes, nasal-labial folds, temples, apples of the cheeks, and "thumbprint" areas of the chin. Correcting these areas can make the patient appear five years younger, or more. Humans instinctually know the age of someone based on how much of the scull is visable. As people age, we are able to see more and more of the scull due to loss of fat, muscle, and hylauronic acid. The key is never to overfill, as that will also catch our eye. Additionally, asymetries can be corrrected, and enhancements can be made, such as adding filler to cheekbones and lips if either is underdeveloped. Deep and fine lines can also be addressed. Ironically, I'm one of the unfortunate few who are immune to Botox. Because Botox has no effect on me, it caused me to become very interested in what fillers have to offer. I do my own injections on myself, so I know how it feels and what the end result will be. Since my skin tone is so light, I have refined my skills to aid in reducing bruising. What should a patient consider when they are getting Botox? Patients should always find out how many units of Botox are being used, and they should only pay for Botox by the unit, and not by the treatment area. If you pay by the treatment area, you may overpay because you have no idea how many units you are getting. Also, you want to know how many units gives you the effect that you like for each area that is being treated. This way, you can judge whether you would like to increase the dose next time, or use the same number of units that was used the previously. Men should always have Botox placed completely across their entire width of their forehead, so that they will not get an arch in their eyebrows. Women who would like more of an arch in their eyebrows can have Botox placed in the center portion of their forehead only. If a woman already has a strong arch to her eyebrows, then she has the option of having the Botox placed completely across her forehead. What should the patient avoid prior to getting injectables? They should avoid aspirin, Advil, Aleve, ibuprofen, alcohol, fish oil, flax oil, vitamin E, ginko biloga, and any anti-inflammatories for 10 days prior to the treatment to reduce the risk of bruising. The patient can use Tylenol.